No need for spotting scopes or binoculars. When the bullet hits, the black is replaced by a bright halo of fluorescent, chartreuse color that makes the hit instantly visible to the naked eye. Convenient, peel-n-stick, self-adhesive backing. 8" Crosshair Round target with fluorescent orange crosshair pattern, shows bullet holes as splashes of bright fluorescent orange on impact. Available in paks of 6 or 50 targets. Includes repair pasters. 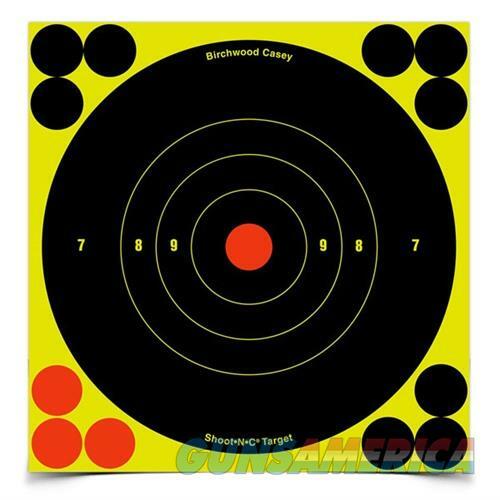 8" Laser Reflective Round bullseye target with stick-on reflective target centers that provide maximum contrast of aiming dot from laser sight or laser boresighter. Turns fluorescent chartreuse on bullet impact. 1", 2", 3" Bullseye - 12 sheets with 72-1", 36-2", 24-3" targets. 9" Oval - 5 targets, 15 replacement centers.